It’s been a year where a lot of our clients have wanted to go a bit more personal and commission us to arrange particular songs for their wedding. Lexi and Rob, who got married in Great Fosters in September wanted ‘How Long Will I Love You?’ by Ellie Goulding. We already had this in our string quartet repertoire but Lexi wanted to walk in to the room to another version of the song from the film ‘About Time’. This is a more folk-like version of the song and more upbeat also. So we had Martin, our professional arranger, make a great new and personal version of the song for Lexi (who also requested a copy of the score to frame a sheet of, as a memory of the special day). On a completely different note, Neva who was getting married in Dulwich College, wanted to surprise her groom Matthew on the day. She did this by commissioning us to arrange a Snoop Dogg track for quartet! This was not the first rap request we’ve had, but it was the first one that was meant as a fun surprise on the day. Neva was not a fan but she knew it was Matthew’s favourite track by the rapper (‘Who am I?’ is the name of it for anyone interested!). Lots of Brides want to walk in to the beautiful Pachelbel’s Canon. It’s a classic choice and works really well – and it is an honoured and time-bound tradition, especially when it comes to weddings! Some also choose the ‘Wedding March’ as an even more traditional choice. Other popular choices have been ‘A Thousand Years’ by Christina Perri, ‘Kissing You’ by Des’ree and ‘All of Me’ by John Legend. Popular classical choices apart from the ‘Canon’ and ‘Wedding March’ have been ‘Salut’D’amour’ by Elgar, ‘Ode to Joy’ by Beethoven and ‘Largo’ from Winter of ‘The Four Seasons’ by Vivaldi. Also of particular popularity this year has been ‘I Giorni’ by Einaudi and this has been used in various parts of the ceremony. There have been some really snappy tunes for the celebratory ‘just married’ walk back down the aisle this year. Clean Bandit ‘Rather Be’ is one of them. Also ‘Happy’ by Pharrell/Daft Punk. And ‘Empire State of Mind’ by Alicia Keys. We’ve also had requests for ‘Love Yourself’ by Justin Bieber, ‘Wake Me Up’ by Avicii, ‘Titanium’ by David Guetta, ‘It Must Be Love’ by Madness and ‘Here Comes the Sun’ by The Beatles. On the classical side, the favourites are the other ‘Wedding March’, ‘Arrival of the Queen of Sheeba’ by Purcell, and Bach’s – ‘Brandenburg Concerto no. 3’. 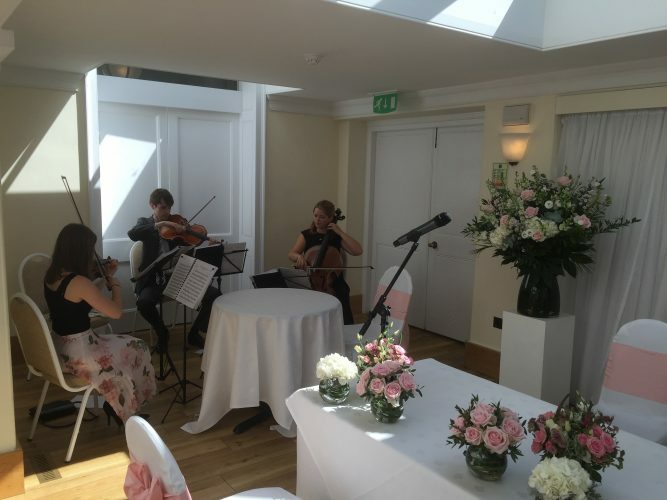 We think that for the ceremony, a mix of carefully chosen classical and pop string quartet tunes work really well. However, all classical or all pop is fine too, depending on the type of wedding and atmosphere you want to create. Ultimately, it’s up to you and it’s a very personal moment. So whatever music you chose, make sure it’s completely memorable tunes that you love. That way, when you hear them again later on – whilst you’re driving or have the radio on at home, you’ll be transported back to the amazing moment you said ‘I do’ to someone you’re really crazy about! To discuss options for live music at your wedding and the kind of songs you might like, do get in touch – we’d love to hear from you.